Stock Market for beginners may not be the book you want to read. You may think of yourself as fairly sophisticated regarding investing. Yet not one out of one hundred know about the Big Money influence on the stock market. Not even full fledged financial planners are taught much if anything on the Big Money influence. If you're like most people, you've recently opened your 401(k), IRA, or mutual fund quarterly statement and are shocked at how much you lost in the stock market. Most people have invested more time planning a vacation than taking care of their investments. Maybe you wish you had your money invested in a money market account or CD. The bad news is even if you had kept your money in cash, you lost money - in most cases a lot of money. Even if you think you've done well by making 8, 10, or 12% per year for last few years, you probably still lost money. 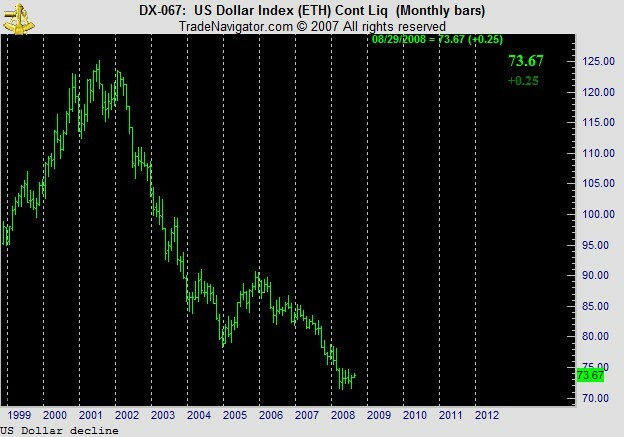 Since July 2001 the US Dollar has declined about 43%. You're either starting in the workforce trying to save for your family or a baby boomer getting ready to retire - and needing to start drawing on your savings. In either case, walking backwards is the last thing you'd want to do. This is where the stock market for beginners should start. 80% of mutual funds lose money. Growth stocks do everything but grow. And your financial planner tells you that you need to diversify. Into what? Let's face it. The way most people pick something to invest in is they pick a fund that's been doing really well. But like watching the wake of a boat, you can see where the boat has been - NOT WHERE ITS GOING! Will that mutual fund that did so well last year do the same or better this year? I want to talk with the captain of the boat and find out where he's going. If you could do that, you'd know where the market was going. And if you had an idea where the market was going, you'd know when to get in and when to get out. Your financial planner, your mutual fund company, and your stock broker will tell you that none of this is possible, right? It IS possible if you follow the BIG money. It is not only the smart money. It is the market moving gigantic money - billions of dollars that move the markets. Huge investment banks, mutal funds, and hedge funds are just some examples of the money that is the BIG money. If these giants of the financial world came to your kitchen table and told you what they were going to do, would you take advantage of this insider information? Analysis in the stock market has to include the biggest players. Big players are huge investment firms, large banks, the biggest wall street firms, etc. If you knew that the really big players were getting out of the market, what would you do? The fact is the smart money or the big money tells the world what its intentions are and no one is listens. The system is designed that way. John Q. Public is left guessing. What stock looks good? What's the best mutual fund to invest in? Is the market going to go up? Am I going to lose money? Hello, I'm David Parrish. Thank you for stopping by. If you've been confused by the markets or market media, then, I hope that this site will give you some clarity on this subject. Analysis in the stock market just got a lot easier for you. If you are brand new to investing, or have been buying and selling stocks like crazy you'll find the right information to help your returns. You'll be able to "get in" the market when the market goes up, and "get out" before it goes down. If you listen to the major financial media and the big mutual fund companies, they'll tell you that is not possible. It is possible or at least has been possible up until now, because I have beaten the market year in and year out. Many people do. And it's all because of the best kept secret on Wall Street. What you are about to find out is not something your financial planner wants you to know about. In fact, he may not know. If he doesn't, you need to get a new financial planner. This will be the best free stock market tip you'll ever get. The really smart money. The really big money. The money that moves the markets has to declare every week what their positions are. In other words, if they are heavy buyers of the stock market, they have to declare it. The have to declare if they are sellers. And virtually every time these big players are heavy buyers or sellers, they move the market. You might say they are the market. We just want to be along for the ride. And if you and me just follow the big money, we can beat the market year end and year out. You don't have to be an expert. All you have to do is find out where to get this information. It is called the Commitment of Traders report. If you want to know what the smart money is doing, you'll find out here. Stock Market for Beginners Blog keeps you up-to-date with all the additions and changes to the Follow-the-Big-Money.com Web site. Subscribe here.